In the true tradition of old world craftsmanship, Ernest Dumoulin S.P.R.L. Manufacture d'Armes de Luxe produces the finest handmade rifles and shotguns in the respect of the esthetic and quality standards that have contributed to the worldwide reputation of Liège's gunsmithing. The very best woods and other materials are used, with no expense spared to bring the sportsman a rifle or shotgun that for now and future generations will be treasured. 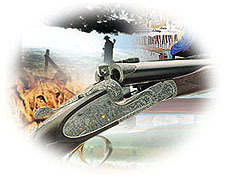 The Ernest Dumoulin reputation as the premier Liège custom gunmaker assures you of the finest and most elegant sporting firearms.